Zong 4G, under its Corporate Social Responsibility program has amazed all of Pakistan with a special 70 year anniversary present to the nation. 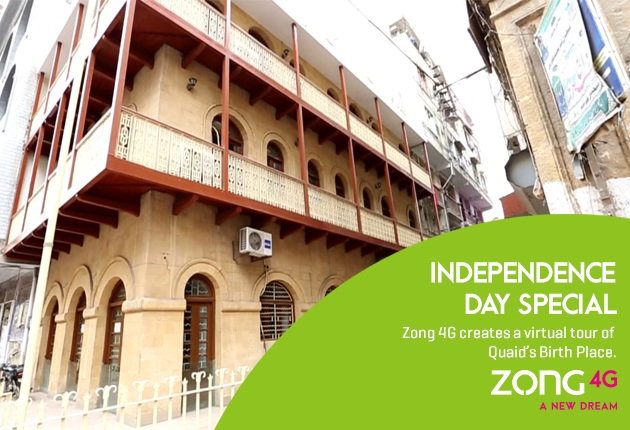 This Independence Day, Zong 4G’s ‘New Hope’ volunteers pay homage to the greatest hero of our Independence, Quaid-e-Azam Muhammad Ali Jinnah, by creating a virtual tour of his birth place, Wazir Mansion, Karachi. This virtual tour, placed at Zong 4G’s Corporate webpage, allows visitors to take a 3D tour of Quaid’s family home. The tour allows a ‘life-like’ experience of walking through the entrance and hallways that were once walked by the great leader himself. The tour allows access to Quaid’s bedroom, study and his library which has the original furniture that has been preserved in its original state. The second floor displays astounding artifacts such as Quaid’s clothing, wearables and accessories that were under his use and gives us a peek into his elegant lifestyle. Wazir Mansion, known officially as “Quaid-e-Azam Birthplace Museum” is a former family home in the Kharadar district of Karachi, Sindh. The magnificent structure was built during 1860-1870 with stone masonry in lime and jute mortar to suit the volatile weather of Karachi. Quaid-e-Azam Muhammed Ali Jinnah's father got the house for rent in 1874 and settled here. Zong 4G, is the leading 4G operator of Pakistan with a 75% 4G market share and 4G coverage in over 300 cities nationwide. The company recently announced its plans to upgrade 100% of its network to 4G by year end. The company has also announced plans to invest over $200 Million in Pakistan in 2017. Zong 4G’s objective, as expressed through the brand promise of “A New Dream” is to leverage the technological edge in 4G LTE to digitally transform the lifestyle of Pakistani people and this remarkable effort is in line with Zong 4G’s ambition to lead Pakistan into a new digitized age. The virtual tour can be visited at the below link.